Q: OK, for those who really don't know you, Who are you and what is your background ? A: Nick Jefferies. Motor Cycle Dealer, Trials Rider, Road Racer, Failed golfer. Q: What would be your Desert Island Disc Luxury Item ? A: A complete set of bound volumes of "The Motor Cycle" (the old blue 'un), from 1903 to 1967. Q: What is your favourite piece music, favourite film & Favourite book ? A: Elgar's "Nimrod". The Green Mile/The English Patient. "Slide Rule" by Nevil Shute. A: Probably my father Allan Jefferies influenced my life more than anyone. He was tough, and didn't really want you to find the easy way to anything, until you had struggled with the hard way! Q: Who are your heroes outside of racing? A: Sir Winston Churchill: would he admit to mistakes in the reorganisation of Mesopotamia after World War One. Alfred Angas Scott (founder of Scott Motorcycles made in Shipley). Why did you leave the Scott factory. and could you have developed the two stroke any further ? Bob McIntyre: How fast would you get round the TT course on your 1957 Gilera 4 today ? A: Appreciation of being able to trust your fellow man. A: Queuing in a shop whilst folk pay for Lottery Tickets. I am very impatient. A: Could be quite a long list. Mainly stunts for David Wood of C.H. Wood films (famous motor cycle film maker of the mid 20th Century). Like: Riding a one wheel bike through Bradford dressed as ancient man with a big club in my hand. Riding a BSA Bantam into Leeds Liverpool canal for a road safety film. Test riding race bikes on the public highway. Driving back from a trial on the roof of a car. Passengering my brother (Tony Jefferies) on any public road. Chasing Aaron Slight round Donington in Touring Championship Cars. Passengering Mick Boddice round Donington (very scary). Travelling through Chang Mai in Northern Thailand with my daughter Rebecca on two Honda 90s and being hopelessly lost. A: Riding the 1974 International Six Days Trial (now Enduro) in Camerino in Italy on a works Jawa 360. Utterly exhausting. I have a silver medal to show for my efforts. Q: What are the 5 best words to describe you ? A: Appreciating, understanding, impatient, annoying, untidy. A: Yes! I have an excellent memory. My niece Loobie (DJ's sister) calls me Mr Google! A: My life sport is now golf, although I could go back to trials. In addition I am an ardent supporter of my old school, (Giggleswick in North Yorkshire), and serve on the committee. I like to walk, I like to wobble round Yorkshire on the scruffiest Honda Transalp you will ever see. I support Bradford City football club. I am passionate about Vintage and Classic Motorcycles, particularly Scotts, I have two. I like old maps. I like to keep my family life active. Q: As Everybody knows, you have a background where racing was part of your family lifestyle, Did you make your own choice to Race, or was it something that you felt honour bound to get into ? Q: In relation to the Question above, did you have to earn your own spurs so to speak, or did the Family help you out with whatever bikes you needed , (Along the lines of Stan Hailwood with Mike) ? A: No I definitely had to earn my spurs. As an example, in 1969 aged 17, I wanted to ride in the National Red Rose Trial near Lancaster. My father said I had to make my own way there. 60 miles there, 60 miles back, and a 40 mile trial. I won Best Novice, and got back after daylight with no lights. It couldn't happen today. Q: When you first started tarmac racing on the Island, you were still competing at the 2 Day Trials. How did you manage to combine the 2 Day Trials and Racing round the mountain into the fortnight . Doing the 2 Day Trials, was this your way of getting a break from the intensity of the Racing on the Mountain Circuit ? A: It was the other way round! Racing was my way of taking a break from the pressure of professional trials. I was a works rider for the Honda Team in Japan, doing World Championships. A: Yes a little, although I think outside the top 20 at the TT is basically similar to doing the Manx. Q: Whilst riding at the TT, you rode with some great team mates over the years. Who in your opinion was the easiest to work with bike wise, who openly shared information with you as to what was going on, not just with the bike, but on the circuit, for example ? ..I wish I could have spent more time with him. Q: Who in all of Motorcycle Racing (past or present), would you have liked to have pit your wits against on the track/road ? A: I would have loved to have Raced in the 50s against Duke, McIntyre, Surtees, Amm, Lomas, Kavanagh, Hartle, Dale, Brown, Anderson, Brett, Armstrong. I am not presuming I could have beaten any of them. Q: It was a bit of a surprise to a lot of people when you called it a day from the racing, What was the prime reason behind this, as you were still at the top of your game ? A: I possibly was, but I had had a succession of big crashes. I had endured a marriage break up, which coincided with leaving the family business. My two daughters stayed with me, and there was no time left to think about racing. I had also lost interest in Honda as one of the bosses was more interested in my ex wife!! Q: I am sure you have been asked this many times before, but I am sure that many people would be interested to know how the Family are doing ? A: The family is well. My youngest, Charlotte is in business management in Abu Dhabi and rides a CRF450 occasionally, and my eldest Rebecca is a married solicitor in London, and has a son Ivor, and has just announced today that she is expecting another child later this year. Brother Tony has married Sarah after losing Pauline(DJ's Mum). My niece Loobie runs Allan Jefferies Motorcycles, is married to James, and they have two children, Megan and Tom. Tom has an electric trials bike and is receiving lessons from me! Q: David. 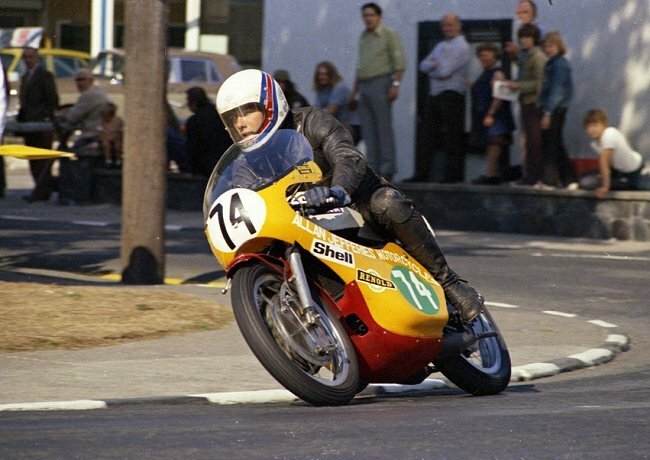 - A great loss to motorcycling in General, TT wise and on the Short Circuits ! Had he not lost his life on that Thursday 12 years ago, what do you think he could have gone on to achieve with all the talent he had ? A: I agree. The world of racing lost one of the best. He is much missed by the whole family. It's a tough game is racing. David had SO much talent, more in his little finger than most folk have. A complete natural. Everyone wonders what else he would have achieved. 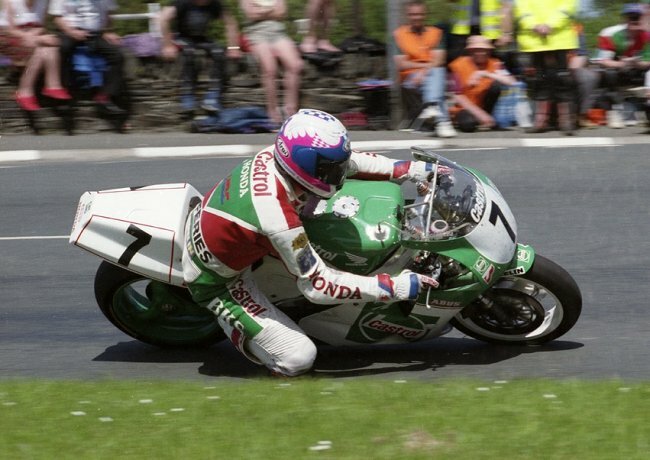 My guess is that he would have had mighty battles with all the current contenders, From John McG to Michael Dunlop, Cameron Donald to Hutchy, and the new kids on the block, like James Hillier and Bradford's Dean Harrison. You know, he would be a few months younger than John McG, so who's to say that he wouldn't be still right up there. Depends how many pies he'd eaten! Q: It was great to see you back out racing at the MGP in 2014, How much enjoyment did you get out of that ? How many times have you now set off down Glencrutchery in race mode. A: 87 starts, although the TT database missed off my start in the 2003 Classic Manx 500cc race. Enjoyment? It's the best thing I do all year with my clothes on! A: The speeds! I'm not going to hark on about safety, smoothness, and course easing (although I do lament what they've done to Windy and Brandish), but it's the speed increases of the bikes that's mind blowing. Also the machinery accelerates, and stops so much better than 40 years ago when I first rode, and the comfort on the bikes is amazing. It's no wonder that the top blokes are doing 130plus, though I don't suppose it would be too comfortable on a modern bike at those speeds. A: There is a far more professional approach to both events these days. Life has changed, with insurance issues, health and safety issues, duty of care, etc. It would be impossible to run the Manx and the TT in the way it was run in the 70s. I applaud the current management team's efforts in energising the events. I don't agree with everything that they have done, but nor would most folk, but at least they've had a good go, and the TT is on a bit of a high just now. Long may it continue. 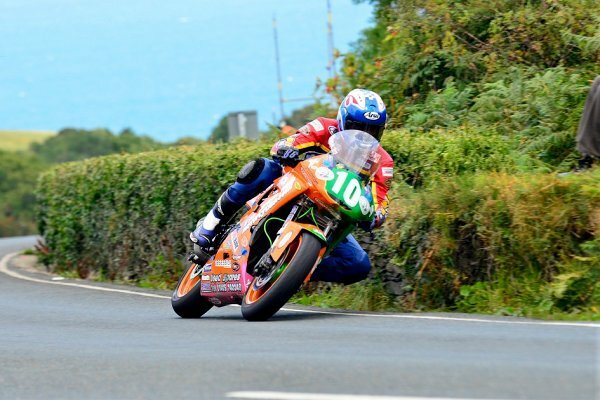 The Manx Grand Prix is a fabulous event, maybe slightly restricted by its name. Well it WAS the Amateur TT until 1930. The change of the Classic Manx to Classic TT has proven the point re the image of the race. I don't agree with everything that's been done there either, but at least the event is on the map, and it is really great fun to be involved in. I have to say that it has been a pleasure carrying out this interview with you, and I thank you for taking the time to answer some of the questions related to areas of your personal life, that others may not even be aware of. Photographs by courtesy of Bill Snelling at FottoFinders.